Chop up the chocolate and put it in the pan. Add 2 1/2 teaspoons sugar. Add 2 tablespoons 10 % cream (35 % is even nicer 'n richer). Once fully melted, taste and add cream and sugar only a little at a time until it satisfies your taste. A double boiler is prefered. Chocolate burns. Always melt chocolate at low heat. Stir melting chocolate constantly to prevent burning and to insure homogeneity. Baking chocolate is best but chocolate chips work well and, in a pinch (if you're desperate) good quality dark chocolate will work. Water is not chocolate's friend. If you use water, the chocolate will take on a slightly chewy texture (which can, too, be fun sometimes - but "sauce needs cream". Use a slicing knife with a serated edge to chop up your chocolate. You will experience less scatter as you cut. 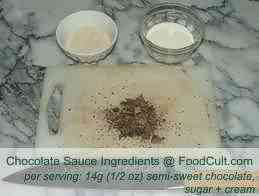 Chocolate Sauce is a foundation element in many desserts. The thing is, it's so impressive - putting together a dessert with a nice, home made chocolate sauce - that you would be embarrassed at how easy it is. In fairness, almost any chocolate recipe should be executed in a double boiler but sometimes we get lazy. We always melt our chocolate on minimum heat (good chocolate, after all, melts in the package on a warm day ... never mind "in your hand") - chocolate burns very easily which is why one should always use a double boiler but ... we can be a little lazy.